GWARD (or Rsp) - a name of the family of Polish .38 revolvers designed for Polish Ministry of Internal Affairs (Ministerstwo Spraw Wewnetrznych) request. The GWARD was designed by a group of designers from Military University of Technology (WAT, Wojskowa Akademia Techniczna) - Marian Czeladzki, Henryk Glowacki, Wiktor Koperski and Stanislaw Ciepielski and Textile Machinery Plant (KMW, Kombinat Maszyn Wlókienniczych) "Wifama" - Ryszard Chelmicki, Tomasz Podgorski and Jan Dudek. The Polish .38 Special revolver ammunition (Lead round nose, Soft Point, Wad Cutter and CS gas bullets) was created by designers from WAT (Marian Czeladzki, Henryk Glowacki, Witold Koperski, Stanislaw Ciepielski and Stanislaw Derecki) and Zaklady Metalowe Mesko (Antoni Sroka, Henryk Pietak and Jozef Klebek). At the beginning of 1990 were created the first prototype models with five different barrel lengths. After the test, in 1991 were created two models called Rsp ("Rewolwer specjalnego przeznaczenia", special purpose revolver) with two barrels - 63,5 mm (2,5 in.) and 101,6 mm (4 in.). The production of both versions started in 1994 in KMW "Wifama" and altogether 1052 GWARDs were created (527 with 2,5 in. barrel and 525 with longer, 4 in. barrel). On the basis of the GWARD revolver two others version was created: a sport revolver (rewolwer sportowy, RS) with 152,4 mm (6 in.) 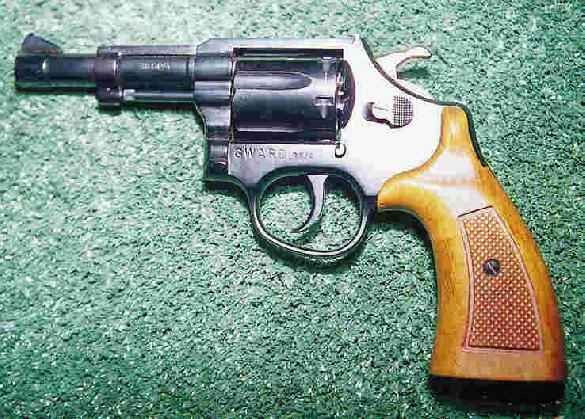 barrel (15 was manufactured) and CS gas revolver designed for self-defence called rewolwer gazowy RG (production started in 1992 and 762 RGs was created). GWARD Rsp with 63,2 mm (2 in) barrel Weight (g): 1000 Lenght (mm): 197 Height (mm): 136 Width (mm): 37 Line of sight (mm): 110 GWARD Rsp with 101,6 mm (4 in) barrel Weight (g): 1200 Lenght (mm): 235 Height (mm): 136 Width (mm): 37 Line of sight (mm): 150 Rewolwer sportowy RS with 152,4 mm (6 in.) barrel Weight (g): 1150 Lenght (mm): 285 Height (mm): 136 Width (mm): 37 Line of sight (mm): 190 Rewolwer gazowy RG with 63,2 mm (2 in) smooth barrel Weight (g): 900 Lenght (mm): 197 Height (mm): 136 Width (mm): 37 Line of sight (mm): 110 Photos were taken by Ryszard Wozniak and Aleksander Rawski.